Today is a very special day. It is the anniversary of our Flag. Indeed, on this special day in 1777, the Second Continental Congress passed a resolution to adopt the current flag as our flag. According to Wikipedia, “The United States Army also celebrates the Army Birthday on this date; Congress adopted “the American continental army” after reaching a consensus position in the Committee of the Whole on June 14, 1775. 1775 – The Continental Army was founded by the Second Continental Congress for purposes of common defense. This event is considered to be the birth of the United States Army. On June 15, George Washington was appointed commander-in-chief. As a special day, I thought I would share with this fun dessert. I had made it last year for my daughter graduation. Since it is quite simple to make (if you do not make those little stars;-), I thought I would make it again for this very special day. First prepare the blueberry jelly. Place the blueberries, water, lemon juice and sugar and cook over medium-high heat. When the blueberries are cooking, and “bubbling, take a fork, and pop the blueberries. Add the pectin and bring the mixture to boil again. Carefully pour a bit of the mixture inside the glasses that you are using and let them rest for a goof hour so that the blueberries jelly will have time to congeal. When they have, start preparing the white chocolate mousse. Pour the gelatin powder into a small bowl and mix it with 2 tbsp of water. Let the gelatin thickens and congeal. Set aside. Zest the lemon and place the zest with the cream into a small saucepan. Bring the mixture to boil. When the cream is boiling, add the gelatin and stir to make sure that the gelatin is melting. Cook for another few minutes, but do not bring to boil!!! Add the white chocolate and stir. Place the panna cotta in the fridge to cool down for 15 minutes. When the mixture is lukewarm, add the greek yogurt. Then pour the lemon mousse into the glasses atop the blueberry jelly. Place the mousse in the fridge so that they will congeal. It will take another hour. Meanwhile, cut the pie crus into small stars. Place the stars onto a silpat that you would have placed atop a medium perforated sheet. Place the egg yolk into a small bowl and with a brush, brush each star. Sprinkle some brown sugar, and cook the stars for 8-12 minutes at 400, or until they are golden brown. 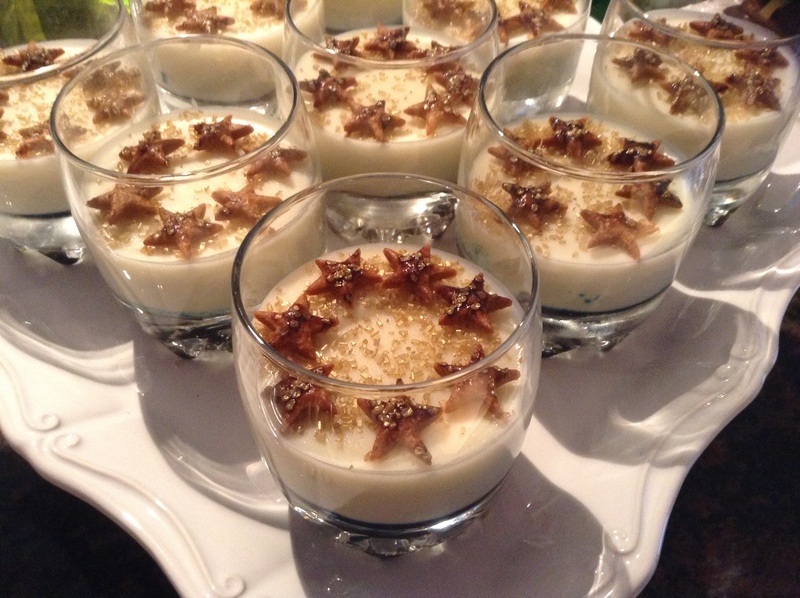 Before serving, place the miniature stars over the white chocolate and meyer lemon mousse and sprinkle some brown sugar. Et voila!!! When the blueberries are cooking, and “bubbling, take fork and pop the blueberries. When they have, start preparing the white chocolate mousse. Pour the gelatin powder into a small bowl and mix it with 2 tbsp of water. Let the gelatin thickens and congeal. Set aside. When the cream is boiling, add the gelatin and stir to make sure that the gelatin is melting. Cook for another few minutes, but do not bring to boil!!! Add the white chocolate and stir. Place the panna cotta in the fridge to cool down for 15 to 30 minutes. Place the egg yolk into a small bowl and with a brush, brush each star. Sprinkle some brown sugar, and cook the stars for 8-12 minutes at 400, or until they are golden brown.